An Armenian born in Turkey, Tchakarian’s family fled the Armenian Genocide by the Ottomans, first to Bulgaria and then France. Tchakarian found work as a tailor, but that was interrupted by World War II; he served in the French Army, but was demobilized when France surrendered to Nazi Germany in 1940. But Tchakarian kept fighting — as a member of the French Resistance. He joined the now-famed Manouchian Group, a Resistance band made up of immigrants, including many Jews, named for its leader, Missak Manouchian, also an Armenian. “They were immigrants who had come from countries that were becoming fascist, like Hungary, Romania, Poland, Bulgaria,” Tchakarian remembered of his Resistance colleagues. The Nazis captured 23 of the group, including Manouchian — most were executed by firing squad in 1944. 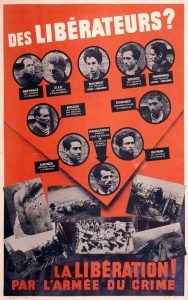 That brought protests, so the collaborationist Vichy government issued the now-infamous Affiche Rouge (red poster, pictured below) in an attempt to discredit them not as “liberators” but rather as an “Army of Crime” (which became the title of a 2009 film based on the group). The poster didn’t work: it instead inspired more to join the Resistance, especially when thousands of the posters were defaced with Morts pour la France! (“They died for France!”) Tchakarian, one of the few who had escaped capture, joined another Resistance group in Bordeaux, and kept fighting until the war ended. After the war, Tchakarian helped publicize the efforts of the Group during the war, speaking at schools and universities, and pushing for recognition of the Armenian Genocide during World War I. In his off time, he gathered all the documentation he could, turning his home into a research library. “We resisted because we loved France,” he said. “It had adopted us.” He dedicated the remainder of his life to the fight against facism, bearing witness to the horrors of Nazism. Tchakarian was given French citizenship in 1958, and awarded the Legion of Honor in 2012. Upon his death, French President Emmanuel Macron praised Tchakarian as “a hero of the Resistance and an indefatigable witness whose voice sounded strongly right to the end.” Tchakarian, the last surviving member of the Manouchian Group, died outside Paris on August 4. He was 101.